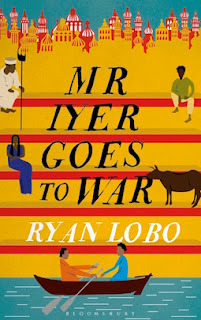 Ryan Lobo’s debut novel Mr Iyer Goes to War is built on a super concept: take the premise of Cervantes’s monumental Don Quixote – about an idealistic (in other words, a crazy and deluded) nobleman who sets out to make the world a better place – and move it to contemporary India, specifically to the Uttar Pradesh of the Varanasi ghats and the Kumbh Mela, the corrupt politicians, opportunistic lackeys and Naga sadhus. Make the protagonist a sixty-year-old Tamil Brahmin who has been confined to a home for the aged; give him an epiphany about being an incarnation of a mythological hero, the Mahabharata’s violent but childlike Bhima; then send this Mr Iyer and his Sancho Panza, an undertaker named Bencho, on a series of adventures. It’s an intriguing idea, and the jacket synopsis may have led to a skyrocketing of my expectations, because I was underwhelmed by the actual book. 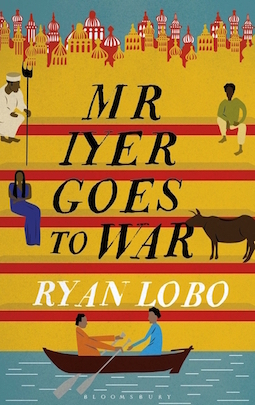 It starts very promisingly: the initial chapters are a lesson in well-observed, economical writing that mixes comedy and pathos, quickly establishing the main characters and the little accident that leads to Iyer’s transformation. But once Iyer escapes the home and begins his travels with Bencho, the prose loses some of its fluidity and the pace flags. Instead of madcap humour flowing naturally from the dialogue and the situations – which is what the book seems to be aiming for – there is too much of “this happened. Then this happened. Then this”. Lobo does some things much better than others. He is a photographer and filmmaker, which could be why some of the descriptive passages and action scenes are so vivid, as if a powerful movie scene were being described by someone with an eye for detail. These passages – which include Iyer’s visions of lives past, and his fantasises about battling the demon Bakasura, who epitomizes all that’s wrong in the world – merge mythical dreamscapes with mundane reality: a row of Reader’s Digests lined up on the floor of Iyer’s room appear to be soaked in blood after an intense dream; a description of a battle that took place in 1565 mentions “hailstones the size of Maruti cars”. The dialogue scenes, on the other hand, often stymie the narrative flow. It is indicated that most (or all?) of the conversations take place in English, which means the reader doesn’t have to allow for translator’s licence and is free to imagine the characters saying these exact words to each other. And much of it didn’t work for me. Some of the philosophical asides read like hokum. (“This too shall pass, Bencho. Have faith.” “Faith? In what? How can God let you be attacked by people you helped?” Bencho asked, pulverizing a mosquito and wondering – just like the mosquito – why, indeed, a God would unleash such monsters upon the faithful. ) There is stilted dialogue. (“Aah, Mr Bhima, come. All you men like to show your teeth when women are present, but why don’t we see what happens when there are a few more teeth in the equation?”) And there is a crucial but awkwardly written scene where Iyer is reunited with his brother’s family, including a belligerent nephew who is meant to sound caustic but sounds trite, like a parrot reciting a soap-opera script. Almost immediately after this slog of a sequence comes another fine descriptive aside – involving a Holi celebration where Iyer sees hooligans as rakshasas and hunchbacks – and I wished the book had more of this sort of thing. Anyone who knows Don Quixote will identify the references in this text: Iyer thinks he has rescued a child from a beating, but once he’s out of sight the beating continues; his books are burnt (except for the Reader’s Digests, because “they are unlikely to give anyone any ideas”! ); he believes he is saving a woman in distress (she plays along; boredom is what’s really besetting her). And there is Bencho, who, like Quixote’s Sancho – or like the irreverent squire in Ingmar Bergman’s film The Seventh Seal – alternates between playing the fool and being a savant, between idealism, self-centeredness and gullibility. “Sir, you’re charging a TV!” he shouts, in an echo of Sancho in the windmill scene. Part of the point of this book is that it is easy to tilt at windmills (or attack television sets that are depicting nasty things), but identifying and pinning down dangers in the messy real world is less easy; this is a place where a truck driver named Aurangzeb might seem a villain to a Brahmin familiar with Mughal history, but could turn out to be an ally in the end (wherein a shout of “Ya Allah” merges with an “Om Namah Shivaya”). Promising as these themes are, I felt it would have worked better if the absurdist scenes hadn’t been accompanied by explicit commentary, or big statements about India’s chequered history, its battles with itself, and the conflict between spirituality and progress. Near the end, there is a hint that Iyer and Bencho might have further adventures in other places – small wonder, since this is a large, varied country with many types of surreal things going on all the time. Both characters are endearing enough that one can see them working well in a less pedantic, more sharply written book. If that happens, this slim novel could spawn a Don Quixote-sized series. The premise looks really interesting and spicy. The cover is good too. Almost tempted to buy and read it. "conflict between spirituality and progress." I don't understand why there should be a conflict. By the way, Interesting that an Iyer character is portrayed as a "nobleman". As Brahmins are seldom noblemen in India. They are largely middle class salaried earners. Iyers definitely for the most part are middle class urban dwellers. Many OBC castes in Tamil Nadu are likelier to have landed wealth than Brahmins. The Brahmin's asset is education and a snarky tongue. Not land.